Chris Hemsworth "wouldn't recommend" the low-calorie diet regime he had to follow for his upcoming film 'In the Heart of the Sea'. 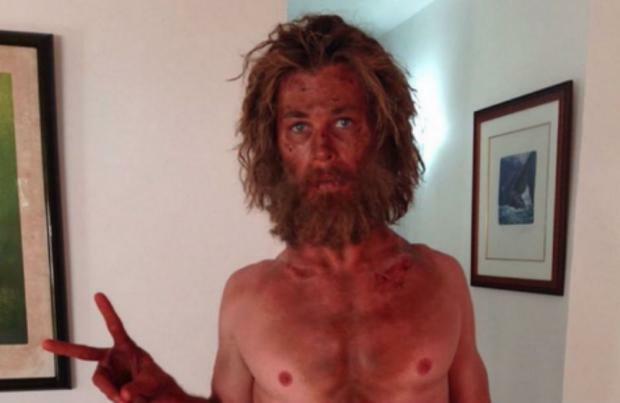 The 31-year-old actor - who is known for his bulging biceps and ripped abs, especially when playing superhero Thor - shocked fans over the weekend when he uploaded a photograph on to Twitter of his diminished figure caused by the regime he followed to play shipwrecked sailor Owen Chase in the sea set drama. He accompanied the picture with the caption: "Just tried a new diet/training program called "Lost At Sea". Wouldn't recommend it.. #IntheHeartoftheSea (sic)." The Australian star recently wrapped shooting the upcoming disaster film - directed by Ron Howard and based on a true event that happened in 1820 - and recently admitted he had to follow the diet for "three or four weeks" in a bid to slim down to play Owen who is stranded with his shipmates at sea after their boat is attacked by a sperm whale. He said previously: said: "We have to shoot the really skinny stuff where we drop down to 5, 6, 700 calories a day, a good three or four weeks and it's going to be pretty uncomfortable, but we'll be together in our misery." He explained: "Anything that is not on the menu is automatically something that you have an absolute obsession with."